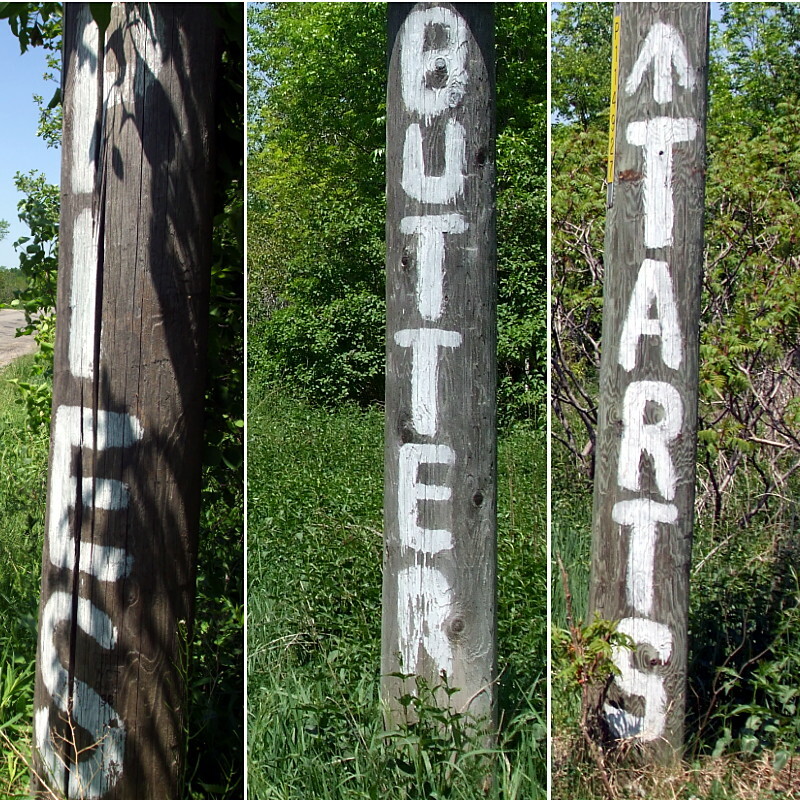 Painted lettering on the hydro poles lining the quiet country road whets your appetite as you approach: “Pies / Butter tarts” and an arrow pointing to deliciousness ahead. 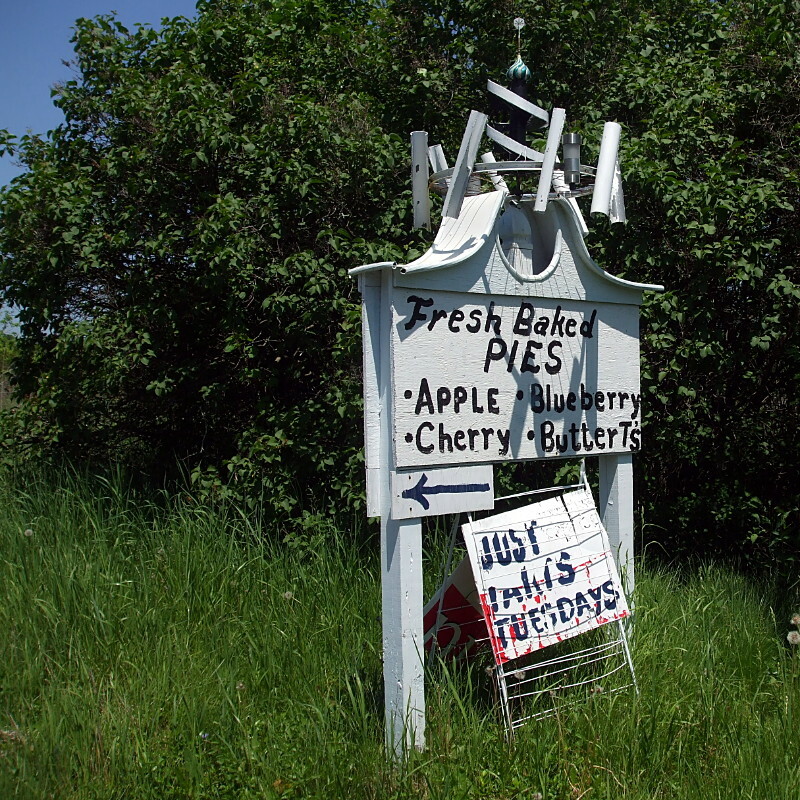 A little farther along, a whirligig-topped sign advertises “Fresh Baked Pies” and “Just Tarts Tuesdays” with another arrow pointing across the street. To a downtowner, life seems a little different in the rural belt surrounding the city. Roads are quiet (and sometimes not even paved), vistas are grand, and payment is on the honour system. But you don’t have to travel far to get a taste of the country. 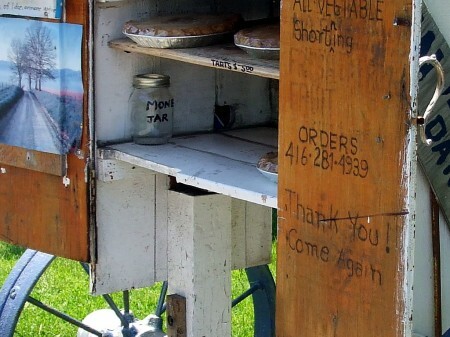 You don’t even have to leave the city: this pie stand sits in front of a home on the Toronto side of Scarborough-Pickering Townline, which separates Toronto from Durham Region north of Finch Avenue. Glenn started the pie stand about six years ago as a sideline when he began taking care of his mother, who suffers from Alzheimer’s disease, at the house. She couldn’t be left alone and he was restless at the house all day long, so decided to start baking one day. Glenn bakes all of the pies and tarts himself but mostly uses his mother’s original recipes. 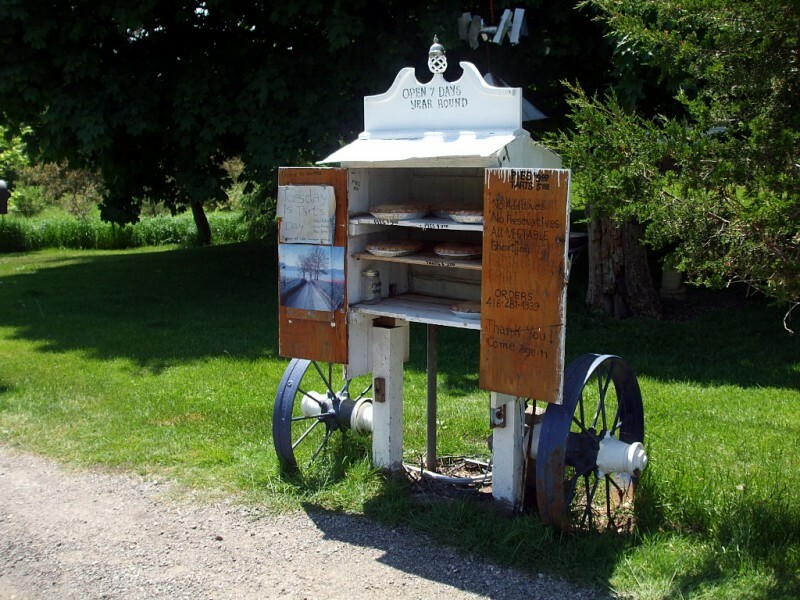 The stand was named Mary’s Pies in her honour and started as just a table and sign in front of the house. “I can still remember the first one I sold.” And yes, that first customer still buys pies. Glenn built the stand later and keeps it open from “12:30–dark” 7 days a week. There’s no staff and the counter is self-serve. You’ll find an assortment of fresh pies or tarts inside the stand on any given day, along with a simple payment jar to drop off $9 for each pie or $5 for a half-dozen tarts. Glenn sells up to 80 pies a week in his summer peak season along with a couple of dozen 6-packs of butter tarts on Just Tarts Tuesdays. He’ll bake to order and takes requests. I’ve really been looking forward to the completion of the trail through the Gatineau hydro corridor that bisects Scarborough. It was supposed to be finished in March of this year, and then in September, but work is still ongoing. All of the paving is done, but traffic signals, benches, and other finishing touches are still going in. I didn’t want to wait until the spring to ride it, so I took a couple of rides last week to check it out. Overall, I’d say that the path is a huge improvement for cyclists who want a through-route across most of Scarborough. 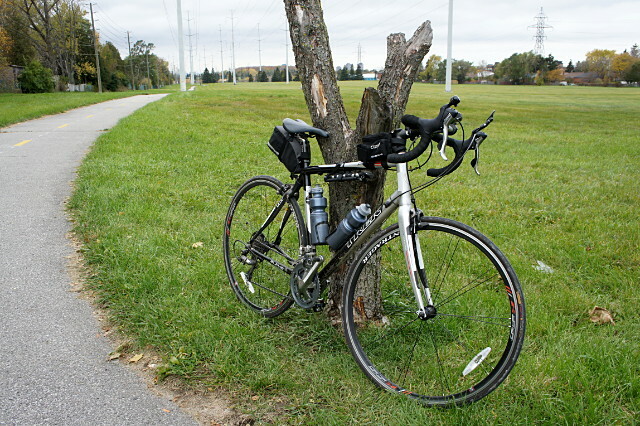 There are still some rough spots along the way and gaps in the route, particularly between Ellesmere Road and the 401, but riding the disjointed route is still preferable to my old routes to get to the northeastern corner of Scarborough and beyond, which involved long stretches of misery fighting with traffic along McCowan, Warden, Sheppard, Steeles, or any of the other arterials where there’s little choice but to put your head down, grit your teeth, and pedal as fast as possible. The Gatineau corridor trail is comprised of several new or upgraded sections of path that join a smattering of Metro-era paths into a nearly continuous off-road route from Victoria Park Avenue just north of Eglinton Avenue clear across Scarborough to Meadowvale Road north of Sheppard. The route tends to meander a bit and goes on-road in two places, sometimes quite a distance away from the hydro corridor before joining up again. The wayfinding is adequate and always shows the next street or two, but doesn’t include major destinations, area maps, or links to other trails. Sometimes you get dumped at a crossing with conflicting signage or no signage at all. 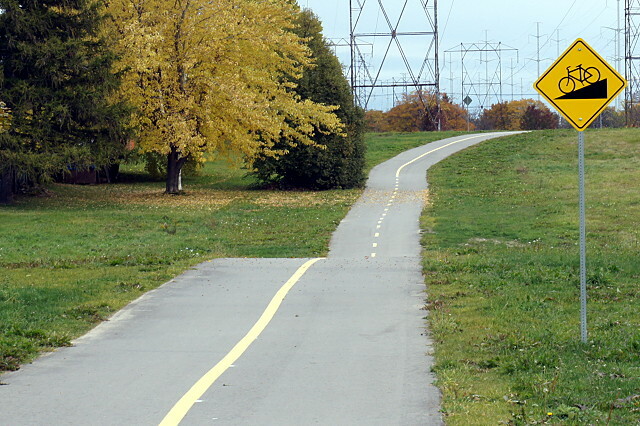 The city’s original project presentations [PDF] for this route recommended an on-street connection along Ellesmere from where the trail currently ends at the western end of Miliary Trail to Conlins Road, where you pick up the trail again after crossing the 401. Instead, I would recommend turning left up Military Trail at Ellesmere, and following Military Trail to…Ellesmere. It adds about a kilometre to the trip, but it saves a truly miserable ride along Ellesmere. In addition to high-speed traffic and relatively narrow lanes, the map doesn’t show that on Ellesmere, you have to climb two big hills out of the Highland Creek valley. If you follow Military Trail instead, you avoid the second valley and only have to deal with one climb. There’s also less traffic and a fake bike lane along a significant portion of the road. Bike and pedestrian signals have been added to all major road crossings, though not all of them have been activated yet. 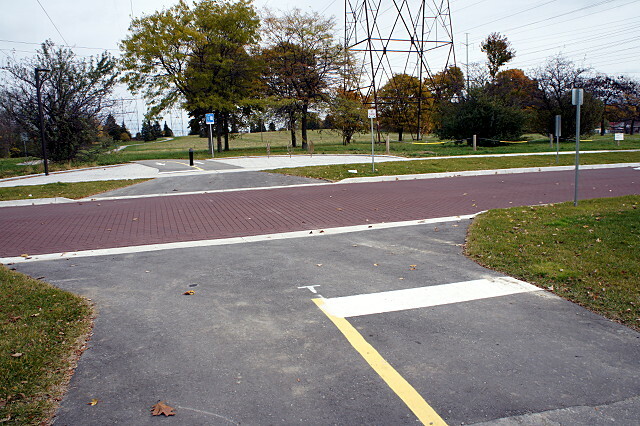 Even when the trail coincides with a major intersection (as at Lawrence and Brimley), cyclists are given their own crossing signals and path adjacent to the pedestrian crossover. At minor streets, cyclists generally face a yield sign and, remarkably for Toronto, are not told to dismount to cross. There are a couple of exceptions, but they both seem to be leftovers from the Metro era trails. For future work, I’d really like to see the two most significant gaps filled in: from Military Trail to Conlins, and from Victoria Park to the Don Valley. Add infrastructure to those two sections and you’ve got a near-continuous off-road path from downtown to the farthest reaches of Scarborough. On its way to the Ontario-Quebec boundary, this corridor passes just a few kilometres away from my cottage. So, when can I get the rest of it paved? The gallery below has a partial tour and some specific commentary about aspects of the trail that I like or that could be improved. Traffic lights and paint will be in place eventually, so I’m not terribly worried about that. I’m looking forward to escaping the city more often via this path.